Never again will I think that a salt mine is just a long tunnel in the ground. When our Polish friends told us we were going to a salt mine, I was not sure what to expect. Somewhere in the back of my mind, I was a little disappointed. My thoughts were along the line of what is so special about a salt mine? We had just been engulfed by the magnificence of the Krakow Old Town, and Wawel Castle. We were still bathing in the grandeur, history, architecture and beauty of visiting Krakow. A salt mine was bound to be a letdown. I was hoping it was much more than just a tunnel into the earth and WOW I was not disappointed by the Wieliczka Salt Mine. Looking back on our visit this site is one of the true gems of Europe and somewhere I really want to visit again on our future journeys. Wieliczka Salt Mine is a UNESCO World Heritage site and was placed on the list in 1974. The site was proclaimed a Historical Monument by the President of the Republic of Poland in 1994. The Wieliczka Salt Mine started operation in the 13th Century and the mine continued operation until 1996. It only closed due to the low price of salt. UNESCO has declared that The “Wieliczka” Salt Mine is one of the most valuable monuments of material and spiritual culture in Poland. The mine is featuring among twelve objects on the UNESCO’s World Cultural and Natural Heritage List. The salt mine reaches depths of over 1000 feet and has 278 kilometres of tunnels. That is less than 1% of the total length of the salt mine. Over 41 million other people have visited the salt mines. I would be surprised if not every one of these people did not leave amazed at the salt carvings and construction of this mine. The Wieliczka salt mine contains an underground lake and many figures and statues carved out of the salt by miners over the previous hundreds of years. The amount of work and intricate detail in these artistic carvings is amazing. Book your skip the line tickets for your Wieliczka Salt Mine visit here! The Wieliczka salt mine is visited by over a million people every year and is located only short way outside Krakow. It’s actually located in the municipality of the city of Krakow. This is why you will often hear it referred to as the Krakow salt mines. You can visit independently like we did (see details at end) or there are many Krakow tours that go the Poland salt Mines. You need comfortable shoes there are over 800 steps both up and down. Wheelchair access available in certain parts of the Salt Mines. Book your guided tour from Krakow of Wieliczka Salt Mine by minibus. 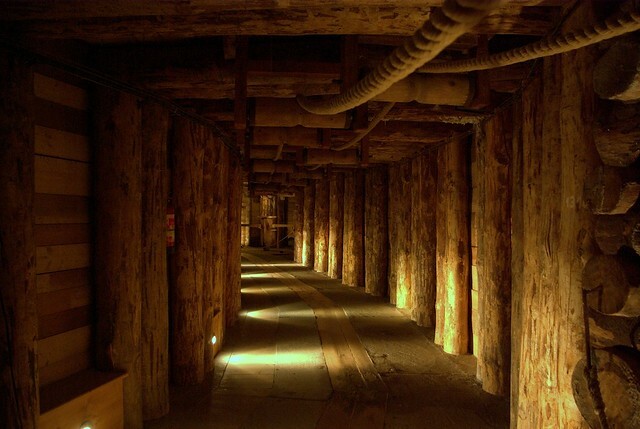 A tour of the Wieliczka salt mine takes between 2-3 hours depending on which tour you take. The tour starts with you having to descend 378 steps deep into the earth with your guide to reach your starting point. Tours are run in English for us travellers and the journey starts at the Danilowicz Shaft. The guides are amazing and during their tour will tell you everything you need to know about the mine and more. As we travelled deeper and deeper into the mine unusual rooms and chambers were pointed out to us. You would see displays of miners working and their old time machinery. The mine is steeped deep in legend of a 13th-century princess who bought the salt to Poland. Even I would be tempted to renew our wedding vowels if it was in this place and for me, that’s a huge call ask Bec she will tell you! In the 13th century a young Polish prince, Bolesław, of the Piast Dynasty, decided to get married. Boleslaw was to marry a beautiful Hungarian princess of the Arpad Dynasty. The princess was the daughter of king Bela IV, Kinga (or Kunegund, as she is sometimes called). With the acceptence of Prince Boleslaw proposal, Kinga’s father asked what she would like to get from him as a wedding present, what she would like to take to her husband and the new country. Kinga being a princess of the people replied that she wanted no gold and jewels, since they only brought unhappiness and tears. Kinga wanted a gift something that could serve the people and make their life better. .Her request surprised the king greatly – she asked for salt. The King was determined to keep his promise. He offered Kinga the biggest and most prosperous salt deposits in Hungary, the Marmaros salt mine. However, nobody knew what Kinga could do with the treasure. On her way to Poland the Princess called in for a visit to the mine. The legend goes she kneeled to pray next to the entrance and. She surprised everyone’s when she suddenly threw her engagement ring inside. When she continued her journey towards the Polish lands, she gathered a group of the best Hungarian salt miners and told them to follow her. When the party arrived in Poland and was approaching Kraków, Kinga stopped and asked the miners to look for salt. The miner wanting to please their princes started digging and suddenly hit something very hard. To their amazement, It was a lump of salt. When they broke it, everyone saw what was hidden inside – Kinga’s engagement ring! That is how the Hungarian princess brought salt to our country. To commemorate the princess, 101 metres under the ground, down in the mine there is the world’s biggest underground chapel, dedicated to Saint Kinga. Book your full day tour from Krakow of Wieliczka Salt Mine and Auschwitz here! Princess Kinga’s chapel was carved by the miners. This chapel was amazing. Words can not describe the detail that was put into carving the status and overall appearance of this place. The chamber has walls carved by miners to resemble wood, as in wooden churches built-in early centuries. I would even consider getting renewing my vowels if I could do it in this place. The sheer amazement that people over centuries could carve this out of salt inside a mine hundreds of meters underground. Carvings and sculptures include scenes out of the bible and even a statue of Pope John Paul II. It’s incredible that miners worked, lived and created all of these amazing pieces of art while in these mines. The mine contains an underground lake that has been transformed into a light show accompanied by sounds of haunting classical music. It must have been a hard life spending most of your daylight hours down in the mine. Our children loved this tour. You know kids, for them it was like one big exploring experience. There were stairs tunnels darkness and the unknown. The tour guide was very friendly, our daughter Willow talked his ear off. She asked him all types of questions and nothing was too much trouble for him to answer. For those thinking about the stairs be relieved, you don’t need to climb them to get out there is an elevator that takes 30 seconds to deliver you back to the surface. Family Travel Tip: There is kids playground near the car park that our kids enjoyed. The Wieliczka salt mine turned out to be one of my highlights of our trip. It was an excellent attraction that was well priced and is a “MUST” see for family travel if you are in the Krakow region of southern Poland. The “Wieliczka” Salt Mine is located 10 km from the centre of Krakow. The mine is in the vicinity of the E40 route. The mine is accessible in a few convenient ways by Krakow Public Transport. By train on Krakow public transport from the Main Railway Station in Krakow (Dworzec Główny) to the Wieliczka Rynek Kopalnia train station. kraków Wieliczka bus number 304 departing in the vicinity of the shopping mall Galeria Krakowska (ul. Kurniki), getting off the bus at the stop called Wieliczka Kopalnia Soli. Zone I (Strefa I) and II Agglomeration (II Aglomeracja) transport tickets are valid on public buses travelling from Krakow to Wieliczka Salt Mine. Kraków Wieliczka bus is the most convenient way unless you are doing organized day trips from Krakow. The following prices for the Wieliczka salt Mine Krakow are valid through 2019. Tickets can be bought on site on the spot and you will be grouped with up to 35. This is one of the major Krakow tourist attractions you will love it. The Salt Mine charges different prices depending on what part of the year you visit Wieliczka Salt Mines. excluding the period from 27/04 to 5/05/2019 and from 1.07 to 31/08/2019. and from 1.07 to 31/08/2019 . Buy your Poland guide here! Krakow Tips: Visit Krakow in April or May for longer days and good weather. You will find less tourist traffic than during the peak summer months when Kraków is very busy. On your trip to Krakow be wary of the pickpockets who operate throughout the major attractions and city streets. You will find many things to do in Krakow. Wow! that looks amazing. especially the chapel in a salt mine. We went to a salt mine when we visited Salzburg but it didn’t have any sculpture etc.. Lots of tunnels and slides going deeper and deeper into the bowels of the earth. Instead of stairs, we used giant slides which my kids loved. That was how the miners would get to work and then they’d take stairs back up. They didn’t have an elevator (and we didn’t have to take the stairs) but a little train that chugged you up and out. Hi Kat! It was amazing down there and if it would help people it would be a great place to spend some time. Our guide said you could lick the salt but I wasn’t sure about how many other people have maybe had a lick too!Thanks so much for taking the time to comment! Absolutely go! We had no idea about it either but that is the good thing about having inside information! It was one of the highlights of our trip! Thanks for commenting! How cool. The chapel looks amazing, along with the statues and other things there it is hard to believe all that is carved from salt. The statues look as if they are just as good if not better than some statues in museums. I would love to visit this place. Thanks. An underground lake. Amazing. !!! I love your shots ….they are so clear despite the low light. And I have to tell you this – I love traveling to all your heritage destinations. Absolutely my kind of travel. Looks like something from a fairy tale! Very interesting, would love to visit one day. That is not what I pictured when I read salt mine! The place is gorgeous!